Introduction: In this short article I am going to share how to create a table valued user defined function to get all dates between specified date range in Sql server. Description: While working with sql server database we often need to deal with dates. Few days back I need to get the dates between the date range I specify. There are many ways to get this but here I have created a function to get the desired result. We can call this function whenever we need just by passing the start and end date. It will return all the dates between these two dates. 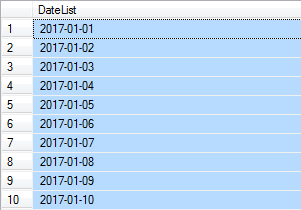 Implementation: Let’s create a user defined function to get the dates between date range. Result will be as shown in image above.